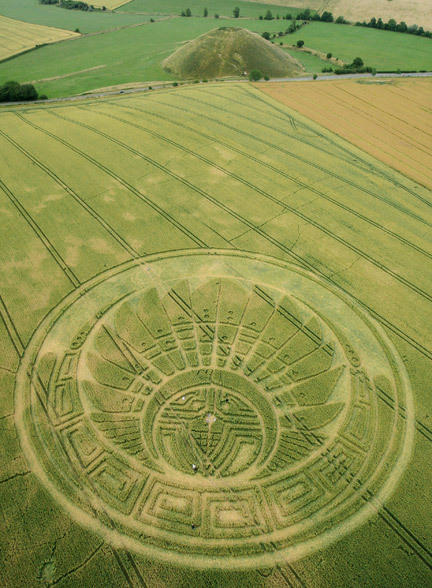 Silbury Hill “Quetzalcoatl Headdress” about 350 feet in diameter first discovered July 5, 2009, around 4:30 AM by documentary film crew that had been camped all night atop Silbury Hill and were first into the extraordinary pattern. Aerial image © 2009 by Lucy Pringle. For other images and information: Cropcircleconnector. July 16, 2009 Silbury Hill, Wiltshire County, England - Three days after the “Quetzalcoatl Headdress” appeared across the Roman Road from ancient Silbury Hill, a website called The Truth Hides printed a peculiar news item on Wednesday, July 8, 2009, allegedly from a Wiltshire police officer's phone tip.